Another one of the better known Irish private banks of which there are a good few notes extant. Here is an earlier version of the £1 note from this partnership. Last edited by DOC on 11 Aug 2018 14:13, edited 1 time in total. A few more denominations from the Tuam Bank. Here is a later example of the 1 Guinea note from this partnership dated 25th June 1813. Last edited by DOC on 11 Aug 2018 14:15, edited 1 time in total. Here is a later type 30 Shillings from the same partnership dated 10th February 1814. Last edited by DOC on 11 Aug 2018 14:18, edited 1 time in total. Here is a £3 Bank Post Bill from this partnership dated 29th February 1812. The note is signed by one of the partners William Keary. Last edited by DOC on 11 Aug 2018 14:22, edited 1 time in total. Here is a £4 Bank Post Bill from this partnership dated 13th November 1811. Last edited by DOC on 11 Aug 2018 14:26, edited 1 time in total. Seems like this bank concentrated mostly on lower denominations and issued the full range of values. Four Pounds is a nice interesting one to have. Yes, many denominations were issued. The highest denomination I have seen for this bank is a £5 Post Bill, scan attached. This denomination is not mentioned in PMI so I suspect it is rare. Last edited by DOC on 11 Aug 2018 14:29, edited 1 time in total. Definitely interesting to see a fiver for this bank, even if it is a Post Bill. Ffrench's Bank was originally founded in Tuam in 1804 by Sir Thomas Ffrench. 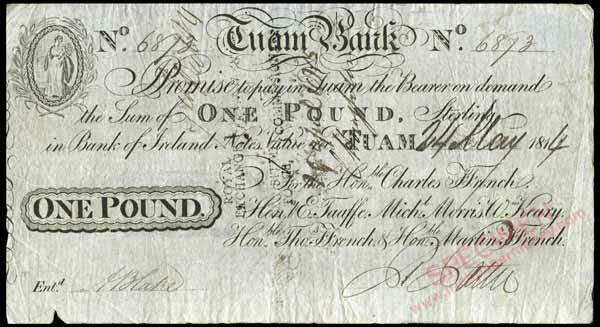 Here is a rare £1 note from 1809 with Thomas Ffrench as lead partner (now described as Rt Hon Lord Ffrench) and partners Henry Edmond Taafe, Michael Morris, William Keary and Hon Charles Ffrench. Interesting also to see that the design of this bill is different to the others picured. Yes, the note has a different design but the vignette depicting a female figure is similar to that used on later notes. From the attached examples of the vignette from later Tuam and Dublin notes, it can be seen that the figure is surrounded by ears of wheat. It seems likely that the female figure is a representation of Ceres, Roman Goddess of the harvest. The earlier viginette is a much stronger engraving. Were they cutting back on the print quality of the notes, I wonder! Interesting point ! Things were not going well for Ffrench's Bank at the time the later note was issued (24th May 1814). The bank collapsed on June 27th 1814. Something to watch out for, quality reduction in a banknote issue! 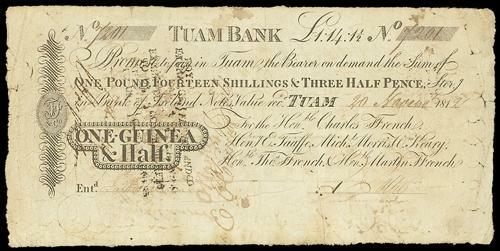 Here is a rare unissued Tuam Bank 3 Guinea Post Bill with Thomas Ffrench as lead partner. In 1805, Sir Thomas became Lord Thomas, a title he inherited upon the death of his mother. However, the title Lord Ffrench does not appear to be used on banknotes until about 1809. The partnership listings on this 3 Guinea note place the print date in the range 1806-1808. Here is an example of a rare unissued silver note printed during the early days of the bank. Thomas Ffrench is listed as the sole partner on this note for 3 Shillings & 9 Pence Halfpenny (1/6th Guinea). The year of printing is most likely 1804 as silver notes were discontinued in 1805. Very interesting. I haven't seen one of those bofore.